Our custom cakes can be decorated and created with as little or as much information you can provide. To give your cake a truly personal touch, we suggest you contact us directly. When you talk to Scovie's, you'll talk one on one to a seasoned Northern Michigan chef that understands your needs. This ensures your satisfaction with the utmost attention to detail. Any size, any design, let your imagination be your guide to a delicious and eye catching dessert. 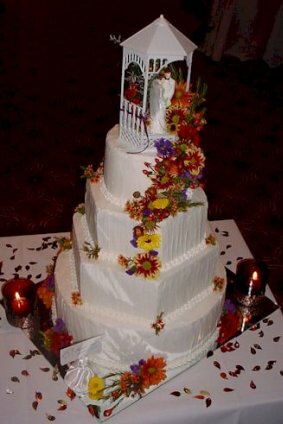 From weddings, to birthdays, Scovie's Gourmet will tempt your taste buds as well as your eyes. See some samples of our cakes on the PHOTOS page. These are not the only offerings or designs - this is only the beginning of what our cake master can do. Prices will vary depending on your design. Call or stop in to create your own unique cake.